Addition of two holes to the southwest area, beside barn - what will become Hole #1 and #18; switch in direction of current hole #1 (basket becomes pad, pad becomes basket location), and removal of current hole #9 and #15, and a renumber of holes. Big changes at Avon. The concrete is setting right now. All holes can be played the same as of today. Update to come when pins move. The revised course is done, the pins have been pulled tonight and tomorrow for renumbering. 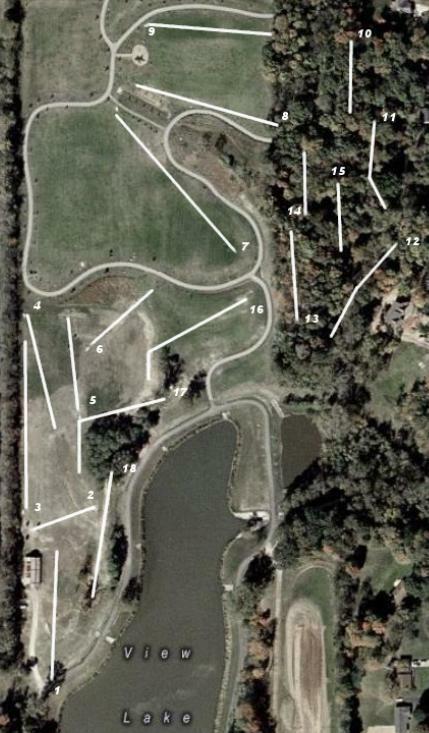 The new course should be ready for hcdgc events starting with this Sunday's Doubles. The new layout begins just to the right of the gravel path, leading up to the barn. Here's the basics of new layout. Distances not confirmed on new holes nor has numbering been confirmed. Pins are in the ground. "New" course is ready for play. There are no signs as of now. #1 is to the right of path leading to barn. #2 is old number 4. Then old 5, 6, 7, 8. Then old #1 [reversed]. PLay from where pin used to be to where tee used to be. Then onto old #18, 10, 11, 12, 14, 16, 17, backtrack to old #13, then out of the woods for old #2, 3, and new #18. The map above is correct. If anybody is able to accurately measure the distances of new # 1, 7, 18, please post. Have fun at the "new" Avon!! First tourney Sunday Doubles 6-28-09. Course is playable and lots of fun. Watch out for other-golfers and walkers all over course. If I can get somebody to hold the end of the tape I can measure those distances tomorrow. Weds, the 8th. After work, about 5:30 pm. Is this Jeff "Nuge"? email info@hcdgc.com. I might be able to be there. I took care of it....hole #1 is 281 feet, hole #7 is 453 feet, hole #18 is 240 feet. If we want more accurate measurements I could get the instrument out and give exact distances, with elevation changes as well. And yes I am Jeff. Also talked 4 guys into coming out for Sunday doubles. WHATS UP? I really enjoyed the new course layout, great work there. Maybe the continued pestering of the parks department would eventually lead to longer tee pads. Also, I had a great time at the bag tag Saturday evening, my name is Nick and I have the #13 tag. I plan on overtaking both Collins at once! All 18 holes have a standard sign, and all pins are set and locked. Hole #12 is 20 feet LONGER. Its original trajectory is kept intact, but extended. There is, however, a precarious 4-inch tree just in front of the pin. Its survival is questionable. HCDGC club members will soon be informed of future dates to improve their home course.